Posted by on Thursday, January 22nd, 2015 at 10:45am. From the outside, your home has great curb appeal, a perfect lawn, mature landscaping, and it’s in a desirable neighborhood. It’s competitively priced and your realtor is showing it daily. The problem is it’s not selling. Maybe it’s time to address the inside or your home. Potential buyers like your floorplan, your floors, and the size of your bedrooms. But what is distracting your potential buyer could be your décor. When marketing your home for sale, this is the time when you need to appeal to the masses or create a neutral style enough to allow your home’s features to shine. As we know, first impressions are most important so it is essential to welcome the potential buyer with a home they can envision themselves living in and enjoying. Staging your home to sell means highlighting your home’s strengths and making it appealing to the largest group of buyers in your area. Here are a few suggestions to make sure your home shows at its best when marketed for sale. It is best to scan your home before listing your property for sale and make sure all of your home’s features are not being hidden. Brighten rooms by removing dark curtains. De-clutter showing off your homes upgrades like cabinetry or a fireplace. Clean out closets and storage areas – yes, buyers look in these areas. Make sure buyers can see what makes your home special. Removing extra furniture can make your space feel much larger. Pare down in all rooms, removing clutter, extra tables, extra chairs and knickknacks. Pull the sofa back from the wall and add a console table with lamp behind it. Try angling furniture to see if your space seems larger. If you have smaller bedrooms, consider removing large nightstands and replace with smaller covered tables with just a lamp. It’s easy for a space to look smaller when you cram furniture and accessories into the room. When it comes to updating your home, small changes can make a huge difference. Just by adding a coat of paint to old and replacing the hardware makes cabinets look new again. 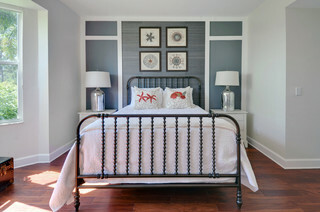 Even a new, neutral coat of paint on the walls can have a powerful impact. Remove out of style furniture. It may be your favorite piece but it’s best to put it in storage until your home sells. Remember, you never get a second chance to make a first impression. Make your first be a lasting one for your potential buyer. Happy Selling!